I've been doing a lot of virtual races this year. I've always been kind of on the fence about them--I get plenty of opportunities to do live races, but I have to say that the virtual races have all been fun and motivating. 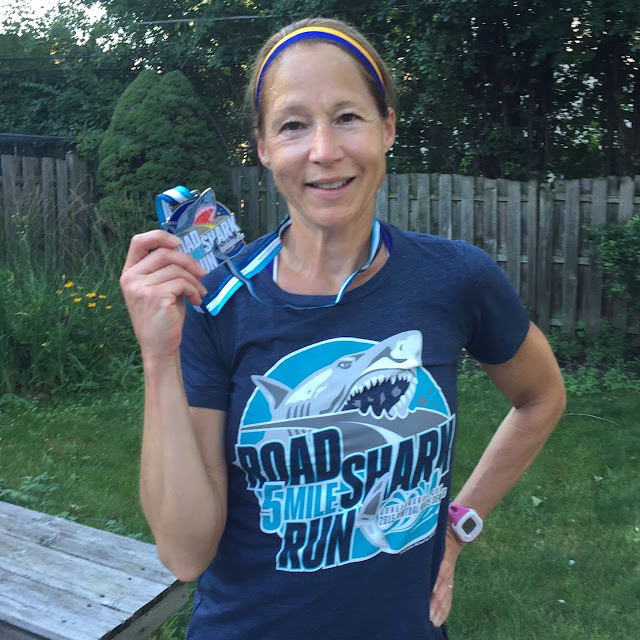 This one, #5 for the year, the Road Shark Virtual 5 miler, was the first one that actually pushed me to hit my goal pace. I had a blazing fast speedwork run on Thursday, with sub 8 minute miles. But that was not a race. If it was, I would have finished with the pace I ran for today's race, 8:45. Because between each mile repeat, I get to stop and walk, which I do for about 30-60 seconds. That's the nature of speedwork. You go all out for the set distance, and then you recover. Briefly. I even stopped for water after mile 4. In the interest of full disclosure, I have my Garmin set to stop when I do. So sometimes, my paces don't accurately reflect actual time on the road. It really depends on what workout I'm doing for that day. But when I do these virtual races, I make an effort to simulate an actual race and I don't stop. This morning on the training plan I had 5 miles at marathon pace. I wanted an 8:45 min/mile average pace. I looked at the weather--it was perfect: 65 degrees, low humidity, bright sunshine--and took my sore legs outside to get a signal on the Garmin. CrossFit this week took a toll on me! Once the signal finally locked in, I slowly headed down the street, willing those really sore legs to loosen up. Even with all the foam rolling and stretching I did, I was tight and sore. I haven't had a run start out easy since before we did that strength cycle. Ouch. Thinking about all the benefits to come from that hard work, I pushed through the pain. Money in the bank, right? About a half mile in, I felt things start to loosen up, and the legs moved much easier. I picked up the pace. Listening to my music, I moved along the frontage road towards that busy suburban arterial that borders my neighborhood. For such an early hour--630 am on a Saturday--I was surprised by all the traffic! The road is being resurfaced, and the crew was hard at work when I ran by. Not something you see on a race course, there are some interesting distractions on the virtual run! After the first mile, I turned onto the sidewalk back into my neighborhood. Lots of people were up walking their dogs. I saw a couple of my neighbors and waved hello. But no stopping to chat. I was racing, even if no one knew it! I rounded through my route, along the other busy road that also borders my neighborhood, and headed into the large park where there's water. I assessed my thirst and sweating--I felt good. The low humidity was really a plus today, and I decided not to stop. At the south end of the park, a large group of cyclists was getting ready to roll. They all greeted me with a wave, and passed ahead of me. I decided to take the frontage road home for that last mile instead of weaving through the neighborhood streets. Anyways, glad for my impromptu detour, I reflected on all the thoughts I had on this run. I tried to shake them off, focus on the run, and pick up the pace. Mile 4 was slow. Tom Petty's Running Down a Dream came on, and that got me moving again. I thought about the lyrics, and how great they were for a runner chasing a dream. Think I can make my goal at Chicago? I do. I can. I will. God willing. I hit 5 miles right at the intersection of the frontage road and my street. I hit stop on the Garmin, and walked the last half block home. Assessed how I felt. Pretty darn good. I am so glad I had committed to this virtual run. The distance of 5 miles and the fact that it was a race kept me accountable, especially because I was so tired from a very intense training week. Plus there was that bling to earn. It would have been easy to just make this another 5 mile run. But I hit that goal pace of 8:45. On the dot. It's all about confidence at this point. I have to believe that I can do this thing. Yep! I can and I will!!!! Gone For A Run provided me with a free entry and swag in exchange for a blog post about the race. But all the opinions are mine. 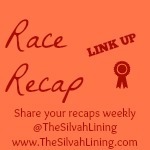 I'm linking this post with The Silvah Lining and her weekly Race Recap link up! Got a race to share? Link it up! You know we all love reading those recaps. Way to go! You make training look easy :-) I did several virtual races last year, especially during the winter when there's not much to choose from for actual races (in Iowa). I think they're great and serve a great purpose...a chance for people to "race" at their convenience, or earn some bling for a much-needed training run, and most of them support a worthwhile cause or charity. High-5 to you!! I think the virtual races are really fun to incorporate into my marathon training! I love using virtual races for motivation and accountability. And the Gone for a Run swag and bling never disappoints! Awesome job! That's a great pace to hit for 5 miles! We were going to do that one too but to be honest we were getting a little overwhelmed with all the virtual races lately. Perhaps we will run one in the fall. I have to admit though that the swag for. This shark race was just awesome!!!! 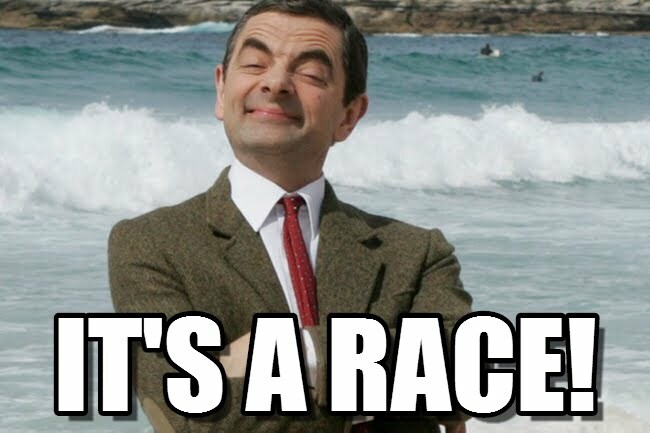 I have to agree with you about the virtual races. This one fit nicely in my training plan, tho. Cool! I've always wondered about doing virtual races and organizing them as a fundraiser. Love the swag you got plus it seems like a race just makes us try harder! Thank you. Oh, for sure, having the race made me push a little harder! Awesome job! I love virtual races and I've done two this year but I'll probably do more. Way to go, chica!! You did AWESOME on this run!! Woo hoo! Awesome job, Wendy! You are killing these runs!!! I have never done a virtual race but the medal and shirt are so sweet that I'm thinking about it now. That is scary about the dog jumping up towards you. I think it's on the owners to get their dogs well-socialized so that they can keep their aggression in check. But maybe the dog knew about the shark theme and was trying to go on the offensive? Who knows, right? Haha! I think you're right about the dog. It was all about the shark! ugh...the out of control dogs!!! I repeatedly come across people who have these tiny dogs who run at you while you are on your run, and do nothing to stop them... if your dog grabs onto my leg during my run, I'm sorry but I am going to kick it away and keep on running! Great race:) Bravo! "Oh, he's so gentle!" as the dog lunges towards me...what part of animal don't you understand? Way to go! I like that virtual races allow you to really push yourself but to do it on your own terms. I dog jumped up on me once while I was out running and I kneed him in the belly. I love dogs but jumping =no bueno. Well done on the race! I spy a Boston headband..
Amazing race! You hit your goal right on the head! I did the Nuun Run Ride Hydrate virtual race in July (which I remember seeing you do on Instagram!) and really enjoyed getting to race but without the crowds and the fuss. I'm confident that you are going to crush your goal at Chicago - you're doing so well in your training! So far so good with the training. This fit right in my plan. I love that you can hit your race pace in a virtual race. I'm always so amazed at the difference in my pace when I'm by myself vs with other people. It makes a huge difference! Running a virtual race makes me more accountable--I just can't quit on myself. Good for you. I need others to run with or I am not motivated. I'm pretty self motivated--this is just one more thing. 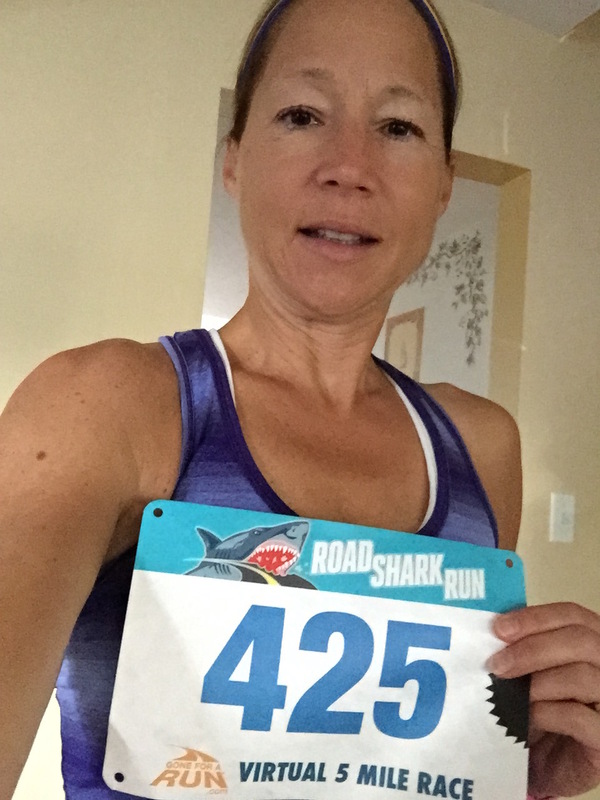 Awesome job Wendy :) I like to treat a virtual run just like a real race as well. I missed out on this one, but I am doing the sole sisters ;) Can't wait! Your strength training is really paying off! You look awesome and you are really pushing out some great runs. This was a fun one! I saw that Sole Sisters run. What a great theme! Congrats on your 5th virtual race of the year! I ran a virtual race once. It was a 10k and benefited PAWS Chicago. This seems to be the year of the virtual race! Way to go, Wendy! I love virtual races too! It's definitely a great way to keep you accountable...and moving! I've run out of words to express how inspiring and what a great writer you are, so I'll leave it at that. (It's been slow but wonderful catching up on all your writing that was posted while I was away and disconnected from the internet). Nice to have a virtual race like this to push you to nail your workout after a tough week. You are doing awesome, Wendy! Cute shirt and medal! Love Mr. Bean! I think you are right on target for your Chicago plans. way to go with your run! and just some perspective on the dog...lots of apartment communities have breed restrictions so often people are forced to give up their pets. i don't believe there are bad breeds - just bad owners! From your lips to God's ears, girlfriend! I'm a huge pit bull advocate. Two of my three children are pit bulls. lol So while I hope you don't blame his breed or automatically assume that he's vicious based on that, I agree that that behavior needs to be addressed. Regardless of his breed. That behavior would need to be addressed if it was a chihuahua. I despise irresponsible pet owners! If he lets that behavior go uncorrected, he's setting that poor dog up for failure. Great job on that virtual race!!! Someone said it above, but it's worth repeating..there are no bad dogs, just bad owners, right? Great job missy! I want to do the Run Now Beer Later Virtual 10K!!! A virtual run sounds fun! Yikes on tha "puppy"!